One should never embark on a career as a writer without understanding the challenges he or she will face. Perhaps the biggest is keeping at it day after day after month after year. Most writers think about quitting and some even do for a while before their need to be creative drives them back. If a writer is fortunate, they have friends to help them over the rough spots or perhaps a local writers’ group. More of us have formed bonds with other writers in online communities. 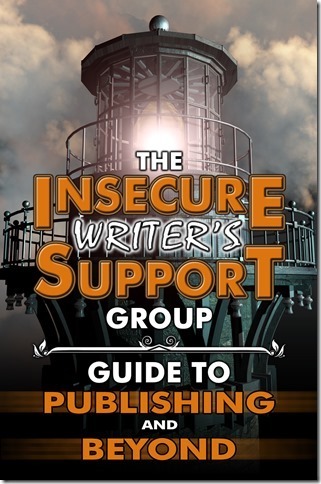 The best online group I’ve ever hitched my career to is the Insecure Writer’s Support Group. This IWSG has a blog hop on the first Wednesday every month where writers share their woes, insecurities and also offer encouragement and advice. This group is more than three years old and the brainchild of super blogger and bestselling science fiction author, Alex J. Cavanaugh. Sometimes the posts are emotional outpourings to others who understand the challenges of writing. Writers share advice on everything from marketing to technical support. The participants range from new writers with only a few pages under their belt to multi-published novelists. The support and expertise found in this group is impossible to describe, but now you can share in it for free. Alex and the administrators, including me, who’ve joined him to keep the group thriving have gathered offerings from the blogging members of IWSG and put it together into a book. In it you will find everything from inspirational essays to detailed instructions on marketing, formatting, the use of social media and almost any other aspect of the business you could think of. And the best part is the price. It’s free! And when you read an article by someone who really speaks to your needs, you can follow the link to their particular blog or perhaps a link to the information they’re sharing. Here’s the blurb. Tapping into the expertise of over a hundred talented authors from around the globe, The IWSG Guide to Publishing and Beyond contains something for every writer. Whether you are starting out and need tips on the craft of writing, looking for encouragement as an already established author, taking the plunge into self-publishing, or seeking innovative ways to market and promote your work, this guide is a useful tool. Compiled into three key areas, writing, publishing, and marketing, this valuable resource offers inspirational articles, helpful anecdotes, and excellent advice on dos and don’ts that we all wish we knew when we first started out on this writing journey. As a writer, I don’t think I’ve ever been prouder to be a part of something as I am about this book. With Alex as our leader, the rest of our group worked many hours editing and evaluating the contributions. Anyone can be part of the IWSG and join in the monthly blog hop. It will bring lots of traffic to your blog and everyone will learn something every month. Thanks, Misty and Vicky, for having me here today. Susan Gourley is the author of 2 epic fantasy series and a bestselling author of science fiction romance that she writes as Susan Kelley.